Lily Ockert and Alex Noble were named second place winners in the prestigious Federal Bar Association’s Annual Thurgood Marshall Memorial Moot Court Competition in Washington DC. On Friday, April 5, NYLS 2Ls Lily Ockert and Alex Noble were named second place winners in the prestigious Federal Bar Association’s Annual Thurgood Marshall Memorial Moot Court Competition in Washington DC. 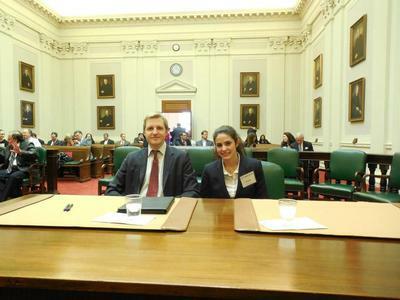 Alex and Lily, coached by 3L Ariella Spitalnick, represented the New York Law School Moot Court Association in this national competition, not only coming in second place out of 45 teams, but also winning the Second Best Brief award. The Thurgood Marshall Competition, which focuses on constitutional law issues, holds every round at a courthouse and uses only actual judges, practitioners, and scholars as judges.